The previous chapters have hopefully shown you how useful SharePad can be when you are sifting through the finances of a company. Information that might have taken you hours or even days to obtain can be worked out in just a few minutes. Understanding how money flows around a company’s financial statements is an essential part of good investing. However, to stand a chance of making money from the stock market you have to know how to apply your financial knowledge. There are lots of different ways to be a successful stock market investor. However, if you are going to grow the value of your savings over time you have to find a style of investing that you are comfortable with. And when you do, it’s important to have the discipline to stick with it. Professional investing attracts some of the brightest minds out there – probably because in recent years it has been so lucrative – but you do not need a high IQ to be a good investor. Common sense, hard work and discipline count for a lot more. In the next three chapters we are going to be looking at three different styles of investing and how you can use SharePad to practice them. This chapter is going to be all about value investing. Buying the shares of a business for less than they are really worth (known as its intrinsic value). Buying them at a big enough discount to what they are really worth so that if something goes wrong you won’t lose money. This is known as the margin of safety. On top of this, you are advised to avoid bad businesses with weak finances. The origins of value investing can be traced back to the 1930’s and a man called Benjamin Graham. In 1934 he – along with David Dodd – wrote a book called Security Analysis which has assumed the mantle of the value investor’s bible. This book is quite heavy going for the lay person, but he later wrote a book called The Intelligent Investor which is a lot easier to read and understand. Having witnessed the terrible losses suffered by shares in the Wall Street Crash in 1929 and the depression that followed Graham devised a way of investing that still aimed to make money but more importantly protected investors from losing too much if things didn’t work out. People have compared his approach with trying to buy a dollar for fifty cents or buying groceries when they are on sale. Value investing is seen as a medium- to long-term investment strategy in which shares are held for several years or more (unless a reason to sell emerges). It can also take time for undervalued companies to recover or to be re-rated by the market. So how do you go about becoming a value investor? This is the question that all investors are really trying to answer. The truth is that you will never get a definitive answer but that doesn’t really matter. What you are trying to find out is a reasonable estimate of what a company’s shares should be selling for. There are a number of ways to try and find this estimate. Many value investors have looked for shares selling for a low multiple of their earnings (a low PE ratio) or cash flows (a high free cash flow yield) or less than the net asset value per share (low price to NAV). The reckoning here is that shares with these characteristics could be too cheap and therefore possibly be a bargain purchase. So one of the first things a value investor might do is screen for shares with low PE ratios or a price to NAV of considerably less than 1. This is very easily done in SharePad. However, the smarter investors will do much more than this. They will compare the valuations (such as PE or P/NAV or their chosen valuation method) with those of similar businesses. Say there are two identical petrol stations in your town. If the BP station is selling for 5 times earnings (a PE of 5) and the Shell station is selling for 10 times earnings then the BP station might be a bargain. Alternatively, the Shell one could be too expensive. It’s also worth checking the history of company valuations. If the shares of petrol stations have historically traded on much higher PE ratios then it could be a sign that the shares are currently cheap. The key part of value investing is finding out why a company’s shares look cheap. More on this in a little while. Another thing good value investors pay close attention to is the price paid for businesses when they are taken over (takeover valuations). The reasoning is here is that prices paid in takeovers are close to the true valuation of a business. So if a petrol station in the next town has just been taken over for 15 times earnings (a PE of 15) then the petrol stations in your town could be very cheap and you should consider buying their shares. Bear in mind though that takeover valuations aren’t always right. Companies can and do pay too much when they are buying other companies. Again, this is where a bit of extra research comes in handy. As well as trying to buy shares for less than they are worth, value investing is about not losing money. These two objectives go hand in hand. One of the reasons why value investors focus on shares with low valuations is that there is already a lot of pessimism baked into the share price. Low PEs and low P/NAVs are often a sign that investors are very downbeat on a company’s future prospects. So when something disappointing happens – such as a poor set of financial results – there’s a good chance that the share price won’t go down too much as people already expected it. The same thing can’t be said for shares that trade on very lofty valuations (such as high PE ratios). Here the expectation is for profits to grow very strongly for many years into the future. This is why when companies with high valuations disappoint investors the share price can go down a lot and inflict some very heavy losses on shareholders. A classic example of this came in the late 1990s and early 2000s when shares in internet and technology companies – many of which had no profits and few assets – plummeted when their businesses couldn’t justify the valuations put on them by the stock market. In other words, there was no margin of safety for anything going wrong. This is why most value investors stayed clear of these shares and were proved right. A great example of what a margin of safety is in practice can be seen in one of the ways Ben Graham used to look for extremely cheap shares. He used to look for companies that were trading below what he called their net working capital value. This is the value of a company’s current assets (stocks, trade debtors and cash) less all its liabilities. Graham didn’t want to pay anything for land or buildings or goodwill (the fixed assets) and reckoned if he could buy a share for less than its net working capital value he was unlikely to lose much money and could end up with a nice profit. Graham used to try and pay a maximum of two thirds the net working capital value. He also used to hold lots of different shares on this basis to reduce the risk of something going wrong. Although he often had to wait for the shares to come good, he often made substantial profits with this approach to value investing. Today, you won’t find many shares trading below their net working capital value. However, in bear markets when pessimism increases more of them tend to appear. SharePad can help you find these types of shares and they are definitely worth keeping an eye out for. The other main way that value investors try and stay safe is by spreading their portfolio across lots of different shares. This is known as diversification and protects the investor from a bad result from some of their shares. Better results can undoubtedly be achieved by holding fewer shares – known as a concentrated portfolio – but if something goes wrong with just one investment it can have a bigger overall effect on your savings pot. Before you can start practising value investing you first need to find some possible investment candidates. The best place to start is to look for companies whose shares have suffered a significant fall in price. Famous value investors such as John Neff and Walter Schloss used to look for shares that were hitting new lows. They were looking for shares where the market had become too pessimistic and there was potential for a recovery. Neff and Schloss used to spend hours sifting through investment directories and newspapers looking for these distressed shares. With SharePad you can find them in a just a few minutes. 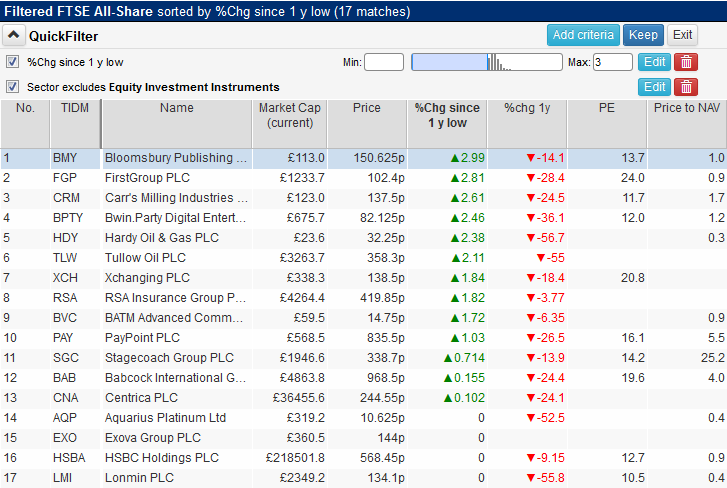 What I’ve done here is set up a filter in SharePad to look for shares where the current share price is within 3% of its one year low. So in other words, I’m asking SharePad to provide me with a list of shares that are trading very close to their lowest prices for the last year. I’ve used the FTSE All Share index here, but you can choose from a number of different indices. You can also choose to set the range to within different percentages of the one year low. I’ve also added some columns to this filter to give me some more information. The percentage change in the share price over the last year can give you some insight into how badly the shares have performed. Big share price falls are a sign that the shares are subject to a lot of pessimistic sentiment which could give rise to a potential bargain. Basic valuation yardsticks such as the current PE ratio and price to NAV also give a quick snapshot of whether the shares could be attractive or not. When the stock market is buoyant and going up you don’t tend to find that many bargains. This can be a sign that the market itself is not particularly good value. When it is falling though, the number of potential bargains increases and the quality of companies available at bargain prices increases as well. If you are going to be a successful value investor then you have to learn to love falling share prices. The best buying opportunities have always tended to have been after the stock market has fallen a long way. Years such as 1974, 1982, 1987, 2003 and 2009 saw shrewd investors pick up good companies at great prices. This is how people such as Warren Buffett have become very rich. However, in order to take advantage of these opportunities you need to have some cash. Therefore, keeping some of your portfolio in cash is a good idea. Finding shares that look cheap is your first step. It’s worth remembering though that shares usually become cheap for a reason. Just because a share looks cheap doesn’t automatically mean that it is also good value. Your job as a value investor is to find shares where the market has been too pessimistic and there is scope for the company to have better days in the future. When it comes to finding out why a share price has fallen, there are good reasons and bad reasons. Let’s look at the good reasons first. One of the most common reasons for a share price fall is a disappointing profit performance. Many shares on the stock market are followed by thousands of professional investors and analysts who spend a lot of their working day trying to predict a company’s future profits. To be a good investor involves taking a long-term view but the City and Wall Street can be very short-term in how they look at companies. Businesses are under tremendous pressure to meet the short-term profit expectations of professional investors. If they fall short, their share price is often hammered even though profits may still be increasing. If this is a temporary blip and the company can get back on track then the fall in the share price can be seen as an overreaction and a therefore possibly a good buying opportunity. If profits are coming under pressure for some reason then buying the shares may be a mistake. Share prices of underperforming businesses are often depressed. Investors shun them as they see no prospect of making money. However, a change of management can often be the catalyst for the share price to go up. If the new management has a credible plan to turn the business around and boost future profits then the shares may be worth a look. As mentioned earlier, a general sell off in the stock market can be a good opportunity to buy shares at bargain prices. During times of a stock market panic, selling is often indiscriminate as investors become fearful of losing lots of money. This can see very good businesses literally on sale at bargain prices. Now for the bad reasons for a share price fall or a depressed share price. Probably the biggest warning sign that you should stay away from a share that looks cheap is because it has too much debt. Debt is the enemy of the shareholder. The more debt (or gearing) that a company has the bigger the risk that shareholders will lose lots of money or be wiped out. Debt makes it difficult for a company to survive when trading conditions get tough. Profits for shareholders can turn to losses and they may even be asked to put in more of their own money to shore up the business. You should therefore pay very close attention to a company’s debt levels compared with shareholders’ equity. Look at the ability of profits to pay the interest bill (interest cover) and also look at other debt-like liabilities such as pension fund deficits. As a rule, shares that look cheap but have lots of debt should probably be avoided if you like sleeping well at night. Shares may also look cheap because of changing technology. Today’s technology can quickly become obsolete if something better comes along. Think of products such as Polaroid cameras or video rental shops that were trumped by new technology. Buying shares exposed to this risk can be very risky. A related issue is rising competition. A company may have taken its eye off the ball and left with products or business costs that make it uncompetitive with other companies. This has happened in areas such as retail where many high street shops with expensive rents and staff costs have found it hard to compete with internet retailers selling direct to customers from warehouses. Buying shares in struggling retailers in recent years has often ended badly. Before you buy any share that looks cheap you have to do your homework. You may get lucky blindly buying shares where the numbers look attractive. But you stand a much better chance of being successful if you take a little bit of time to learn some important facts about a company. This is where SharePad comes in very handy. It can help you answer some important questions about a company’s finances and valuation in just a few minutes. This in turn will help you focus on where to do more research. To show you what I mean, let’s take a company from the one year low list earlier in the chapter and go through how you might start finding out whether you should buy the shares or not. 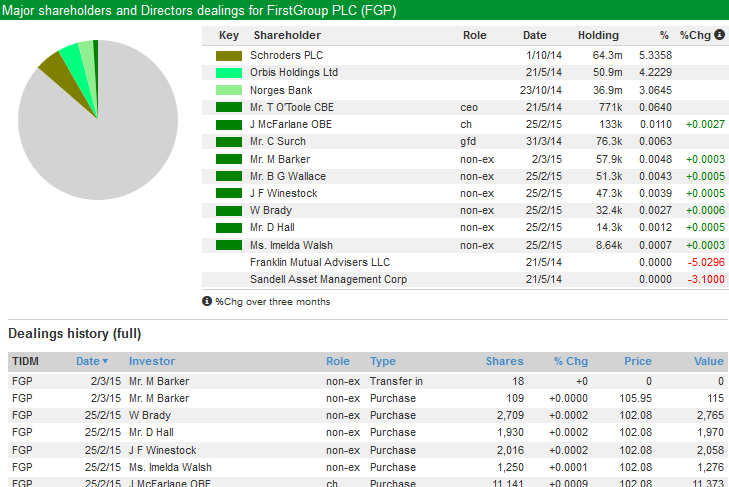 Let’s take a look at FirstGroup. What I am going to do here is use some of the important ratios that we’ve covered in the previous chapters. I am also going to show you some other features of SharePad that can help you to research a company. FirstGroup makes its money from running buses and trains in the UK as well as school buses and other public transport in America. In 2014, its profits were fairly evenly spread across five different businesses. At the time of writing, its share price is just over 100p – 1% above its one year low. Its shares have had a rough time having fallen by 28.4% during the last year. However, the price to net asset value of 0.9 times interests you as it looks quite cheap. You decide to dig a little deeper. What should you be looking at? We can use SharePad to help us by looking at the company’s financial history and trying to get some insight into its future. Let’s start by looking at some key numbers. If you want to understand a company’s future then it is usually very helpful to understand its past. I’d suggest looking back at least five years, preferably ten. Sales are the lifeblood of any business. If a company cannot grow its sales then it may not be able to grow its profits in the future. 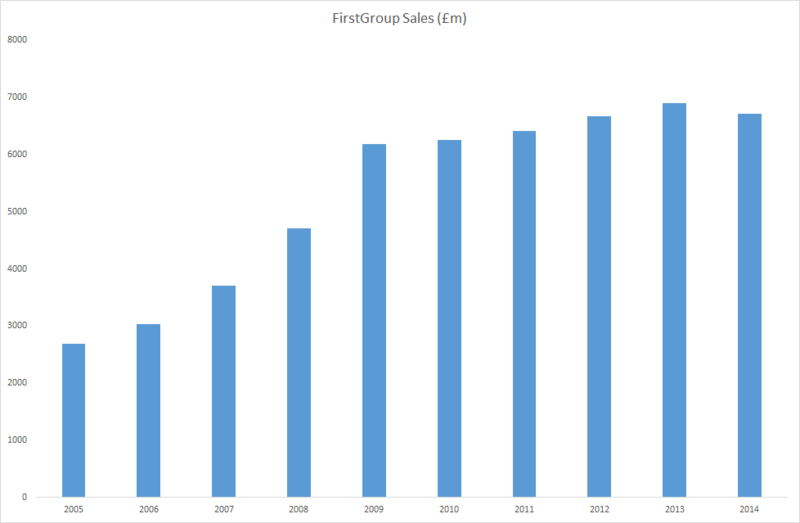 Let’s have a look at what’s been happening to FirstGroup’s sales. This chart above shows FirstGroup’s sales for the last ten years taken from SharePad. As you can see the company has grown dramatically over the last decade with sales growing from £2.7bn in 2005 to £6.7bn in 2014. However, sales fell in 2014 after a few years of growth and this needs investigating as it may be a sign of a deteriorating business. I’ll tell you how to go about finding out about this shortly. The next item to look at is profit. I’m going to focus on EBIT (earnings before interest and tax) as this is arguably the best measure of profit. It is not distorted by changes in tax rates or interest rates. It’s the profit from selling things. What we can see is that the trend is not good. 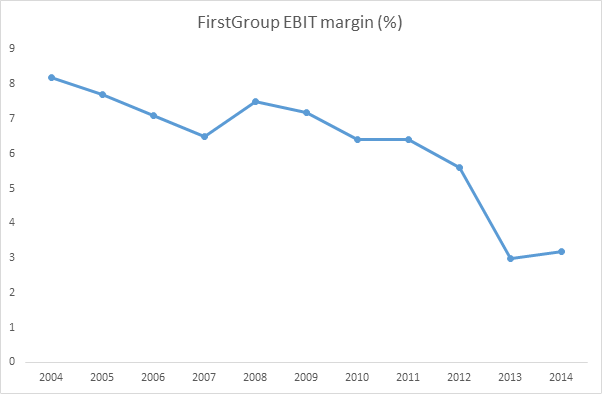 EBIT margin has almost halved since 2012. EBIT margins (the percentage of sales turned into EBIT) were 8.2% back in 2004, but just 3.2% in 2014. Declining profitability and profit margins are not encouraging signs. ROCE is the benchmark of whether a company is any good or not. 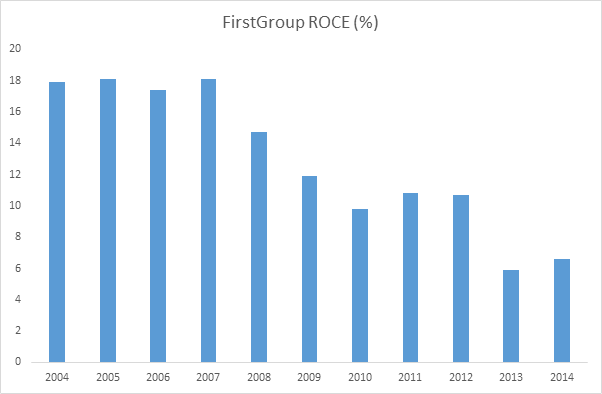 Ten years ago, FirstGroup looked to be a very decent company with a ROCE of nearly 18%. ROCE was just 6.6% in 2014, although this was an improvement on 2013. Ideally, you want to be looking for a company that has or is capable of generating a ROCE of at least 10%. FirstGroup looks a long way from this based on its latest performance. Debt is the enemy of the value investor. It makes it more difficult for companies to survive difficult trading environments. 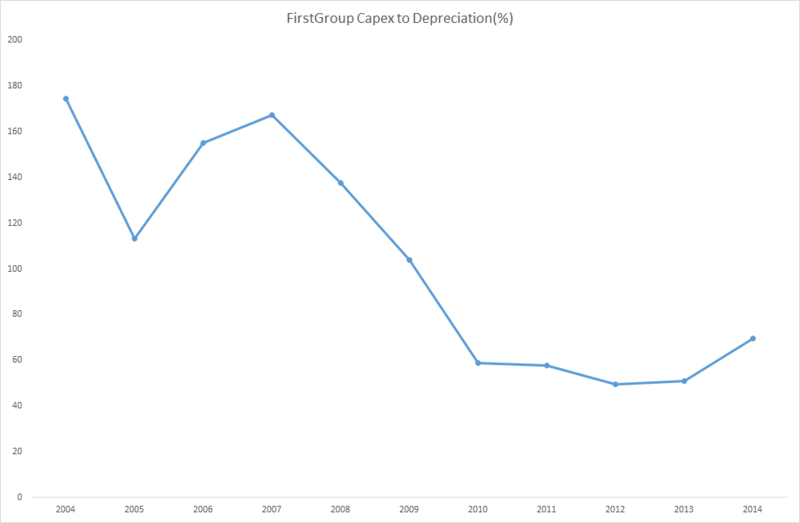 If we look at FirstGroup’s gross gearing (total borrowings as a percentage of shareholders’ equity) you can see it has always operated with a lot of debt. Gross gearing was nearly 350% in 2013 and has been brought down to a still too high 161% after shareholders stumped up more cash by buying new shares in a rights issue in 2013. FirstGroup looks like it still has too much debt for comfort. The ability of its profits (EBIT) to pay the interest on its debt (interest cover) is still looking stretched. 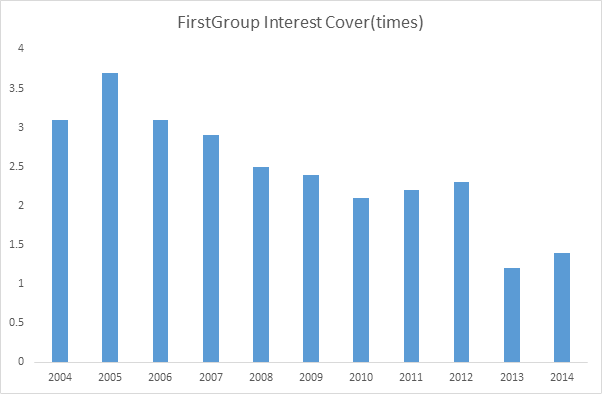 Interest cover was just 1.4 times in 2014. Should the company’s profits come under pressure, then it might struggle to pay the interest bill. This looks a frightening prospect if you are a shareholder and are last in the queue to get paid. Between 2010 and 2013, FirstGroup converted more than 100% of its earnings per share into free cash flow. As a potential investor, this is the kind of trend that you want to see. However, free cash flow was negative in 2014. 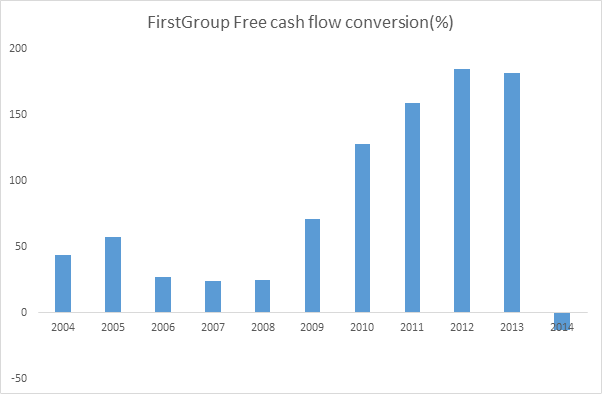 A closer look at FirstGroup’s free cash flow gives us a clue as to why its free cash flow looked so good between 2010 and 2013. Back in the chapter on cash flow, we discussed that the ratio of spending on new assets (known as capex) to depreciation (a proxy for how much a company needs to spend on keeping its assets up to date) was a key driver of free cash flow. Spending more than depreciation will usually depress free cash flow, but spending less will boost it. What we can see from FirstGroup is that it appears to have been spending a lot less on depreciation on new assets and this has boosted its free cash flow. This is something that cannot continue indefinitely in a business. Buses do wear out and need replacing. Are the shares really cheap? FirstGroup looked like it may have been a possible share to buy because it was trading at less than the value of its net assets. What you need to do now is check out those net assets. The first thing that is worth pointing out is that most of FirstGroup’s net assets are intangible ones such as goodwill – £1.7bn in total. In fact, once you take these away, FirstGroup doesn’t have any tangible net assets. Tangible net asset value per share in 2014 was minus 48.7p! This might suggest that there is no real asset value support for the shares if the goodwill attached to the businesses it has bought in the past isn’t worth anything. 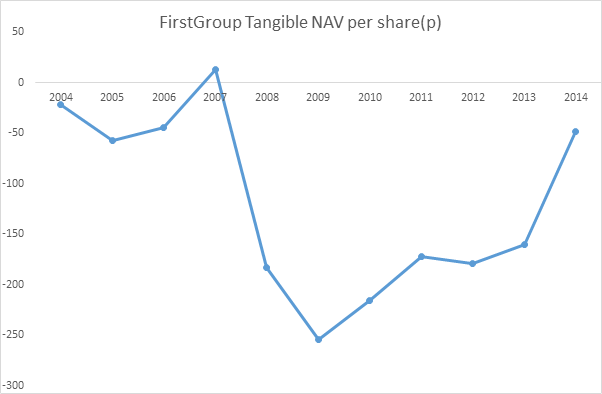 If the intangible assets are worth £1.7billion, then FirstGroup shares had a net asset value per share of 114.4p at the end of March 2014 – not much more than the current share price. If we look at other measures of value such as EBIT yield (EBIT divided by enterprise value) a figure of 8.4% based on 2014 EBIT is not that appealing. Ideally, for a share to be cheap the EBIT yield should be comfortably over 10% based on a sustainable level of profits. 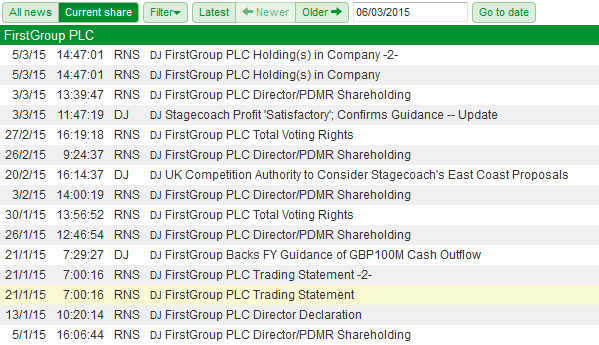 So based on recent trends and its finances, FirstGroup doesn’t look that appealing. However, we have been looking at information that has been based on past events. What’s more important is to have a look and see what might happen in the future. Again, SharePad has some features that can help with this. Whether you should rely on the forecasts of professional analysts when making investment decisions is debatable as they are often wrong. However, they do give you an insight of what the market is expecting from a company and whether the future is expected to be much different from the past. SharePad will provide you with analyst forecasts where they are available. You will find them in the income tab under “per share values” and “normalised” headings. As you can see, analysts are expected a big pick up in profits in 2015. Normalised pre-tax profit is expected to increase substantially from £53.7m in 2014 to £157.5m in 2015 but not grow much afterwards. EPS is expected to increase from 4.3p to 9.4p. At a share price of 100p this would put the shares on a prospective PE ratio of 10.6 times (100/9.4). That’s not a very expensive rating but neither is it exceedingly cheap for a business that doesn’t look like growing much. For the shares to be a real bargain, I’d be looking to pay no more than 6-7 times earnings. 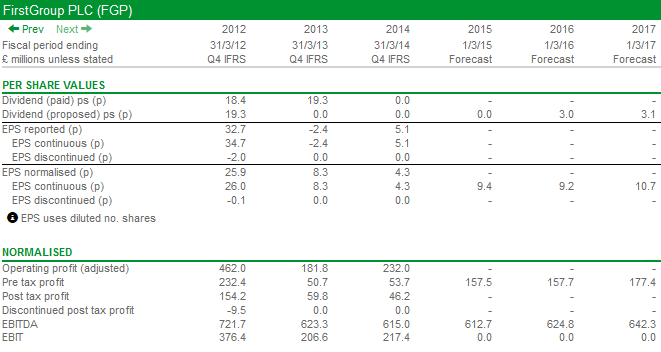 We can also see that no dividend is expected to be paid in 2015 but one of 3p per share is in 2016. That gives a 3% yield on the shares in 2016 if this forecast turns out to be accurate. That’s probably not enough to excite many value investors. One of the really useful things about SharePad is that it gives you access to important news from the company. The most important bits of news come from the Regulatory News Service (or RNS) for short. A company must inform the stock exchange via RNS of any important information such as company results, trading statements, takeovers and directors’ share dealing. All this news is at your fingertips in SharePad along with bits of market chatter from Dow Jones newswires. This makes it a lot easier to keep up to date with what’s going on. By clicking on the News tab in SharePad you get the news feed. Click on the “Current share” button to see news for the selected company. You can see the news for FirtstGroup below. One piece of news that looks particularly interesting is the trading statement on 21 January 2015. Overall trading for the Group is in line with our expectations. Our First Student and UK Bus transformation plans are on track and both divisions are delivering the expected improvements in financial performance. Demand for Greyhound services over the important holiday period was adversely affected by the significant and rapid reduction in fuel prices, which makes car travel more affordable and competitive with our services. This was offset by good performances in First Transit and our UK Rail operations, which are both achieving growth towards the top of our expectations with robust margins. Overall we are on course to meet our full year expectations for the Group, and we are confident that our multi-year plans will deliver improved cash generation and create sustainable value over the medium term. If I was a professional analyst, I probably wouldn’t change my profit forecasts on the back of this statement. It seems that nothing unexpected has happened. SharePad can provide you with a lot of useful news. However, it makes sense to read the latest annual report and visit the investor relations section on the company’s website to find out more information. I’ll have more to say on how to use annual reports in a later chapter. Are directors buying or selling shares? The directors know the business of the company better than any outside investors. If they are buying shares with a meaningful amount of money that is usually a good sign that the company is doing well and that they may think the shares are good value. When you are looking to buy a share you really want to see directors buying shares as well as having a meaningful amount of money invested in the company. I’d always be wary of companies where the chief executive doesn’t have a large chunk of their own money invested. You want the management to look after your best interests by owning shares as well. SharePad provides you with detailed information on this often overlooked aspect of stock analysis. Clicking on the “DD” tab in SharePad will bring up a screen that will show the major shareholders, the amount of shares that the directors own and whether they’ve been buying or selling recently. We can see that the chief executive (ceo) owns 771,000 shares but hasn’t been buying more recently. The chairman bought 11,141 shares recently which is a reasonably encouraging sign. However, to get really excited about director purchases you need to see significant amounts of money beings spent – at least £50,000 or more. Instances of directors selling shares need to be investigated. They may be selling to pay a tax bill on shares they have been paid with or to fund a divorce settlement. Otherwise big sales of shares are hardly a glowing endorsement of the company’s prospects at the current share price and can be enough to stop some people investing in a company. A more interesting case – FlyBe? Also on our new lows screen is regional airline company FlyBe. Its shares have more than halved during the last year but they are trading on a low PE of just 6.3 times. This maybe warrants a closer look to see what’s going on. I’m not going to get into the same amount of detail as I did with FirstGroup, but highlight a few points as to why this might be a share worth buying. Firstly, the financial history of this business is not that good. Although it made a small profit in 2014, in the previous three years it lost money. FlyBe has 9 surplus planes costing £26m a year that it is looking to get rid of. When it does then profits could rise by the same amount. £26m on the current market value of £130m is a return of 20% alone. The company has net cash (cash is greater than debt) on the balance sheet and looks as if it has enough money to survive the hard times it is currently experiencing. In other words, it doesn’t look like it is going bust soon. Directors have been buying shares. The chief executive, chairman and finance director have all bought shares since the trading update and the fall in the share price. This is a promising sign. The largest shareholder – Aberforth Partners – is a renowned value investor in smaller companies. It has also been buying more shares. For these reasons, you might be more interested in buying shares in FlyBe than FirstGroup. Do you have the right temperament to be a value investor? Like lots of things in investing, value investing sounds quite straightforward and seems to have a lot going for it. However, it is easier said than done in practice. Can you cope if the share price falls further? Are you comfortable going against the crowd? Do you have the patience to wait for value to be realised? Do you have the discipline to stick to your strategy? If the answer to any of these is no, then value investing will not be for you. You will need to find another way of investing that suits you better.